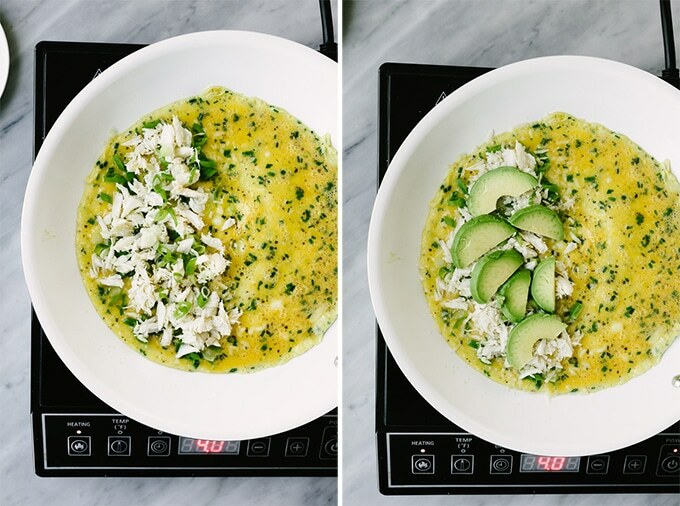 Crab and avocado are a match made in foodie heaven! 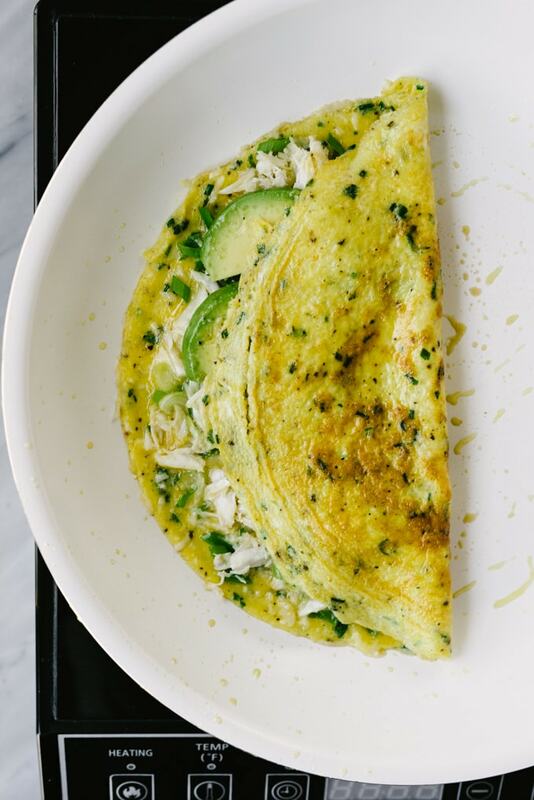 This crab omelet is fresh, filling, and fancy yet fuss-free. 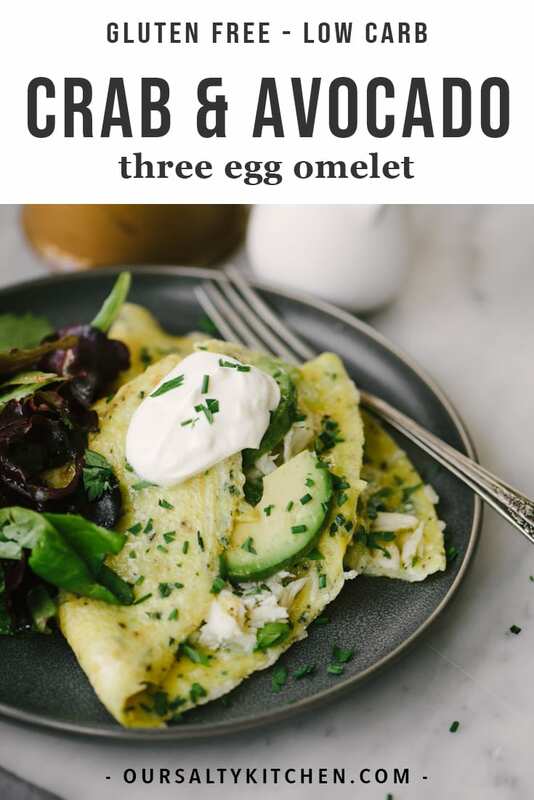 This recipe is fast and easy, so it’s perfect for everything from a weekday power breakfast to an impressive brunch offering. Last February I spent a long weekend in San Antonio with my BFF and her family. On my last full day, we brunched at Southerleigh in the historic Hotel Emma. 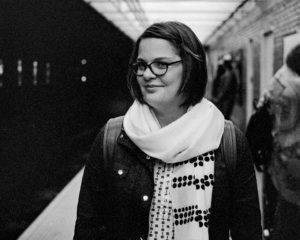 Sidebar – Hotel Emma is a photographer’s playground. The architecture and interior design are stunning, and it’s filled with well considered small rooms, nooks, and crannies. It’s seriously dreamy, and I’m scheming up ideas to go back and shoot there. Anyway, food. For brunch I had a crab and avocado omelet, and I haven’t been able to stop thinking about it. Since I won’t be getting back to SA soon enough, I had to make my own homecook friendly version. I absolutely love crab, and now that we’re official Marylanders and in the throes of crabbing season, I’m enjoying it every chance I get. Unfortunately, Cam is allergic to shellfish so I have to be be careful with the recipes I choose. Luckily this crab omelet is the perfect serving for one, so I can have my crab and eat it too. >>> Pin it now! Click here to Pin this Crab Omelet Recipe to your Brunch Board! This is a classic three egg omelet prepared American style. AKA, the lazy way (folded once, not thrice). 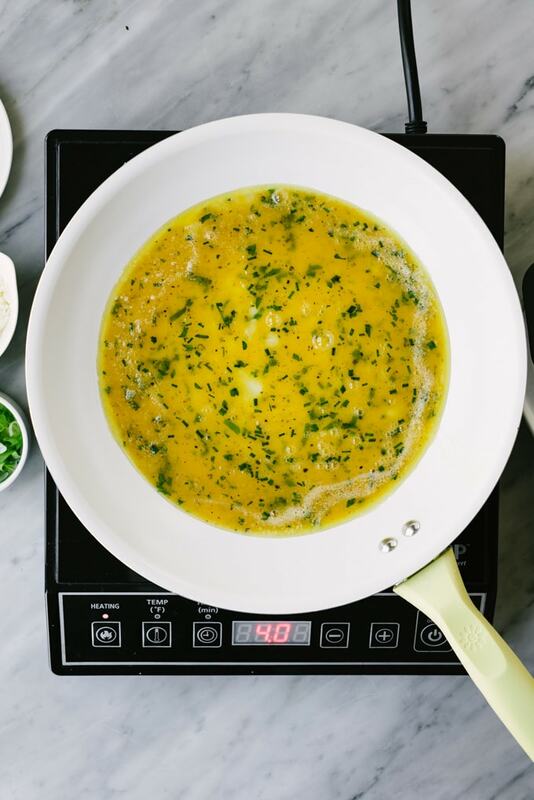 Start by whisking three eggs with some fresh minced parsley and chives, sea salt, and cracked black pepper. Seasoning the eggs with herbs at this stage will impart fresh, bright flavor throughout the omelet. Use farm fresh eggs if you have access to them. If your eggs are super, duper fresh, add a teaspoon or so of water to help break up the whites. Set a 10″ non-stick skillet over medium heat and allow the pan to heat up for about a minute. Add a dollop of butter, and allow the butter to melt, then foam. Once the foam subsides, add the whisked eggs. Swirl the pan to spread the eggs into an even layer over the bottom of the pan and then don’t touch it. Just let ’em cook for three to four minutes until the edges are firm and the center is still a little jiggly. If you see big air pockets forming in the center of the eggs, gently deflate them with the tines of a fork or the edge of a spatula. Once the eggs have set, layer the ingredients into the omelet. I start with parmesan, then add the crab meat, green onions, and avocado, and finish with a second sprinkle of cheese. Make sure you have your ingredients prepped and ready to go, and work quickly but carefully. A note about crab meat – go for the real stuff, and make sure it’s fresh and sustainably sourced. Yes, it’s expensive. But a little goes a long way in this recipe (you only need about two ounces) and there are so few ingredients that you want them to be the best quality you can afford. You literally get what you pay for when it comes to fresh seafood. My co-op offers locally sourced, pre-cooked lump crab meat, and it’s what I used here for ease. If fresh lump crab meat is out of your budget, canned or frozen is the next best option. Check out this guide on canned seafood from Sarah at Champagne Tastes to help you select the best brand of canned crab meat. And if you’re adventurous and have a source, steam and pick your own – it doesn’t get fresher than that! Gently flip the eggs over to form a semi-circle, and then remove from heat. Slide the omelet onto a plate and let it rest for a minute or two so the cheese can get melty. 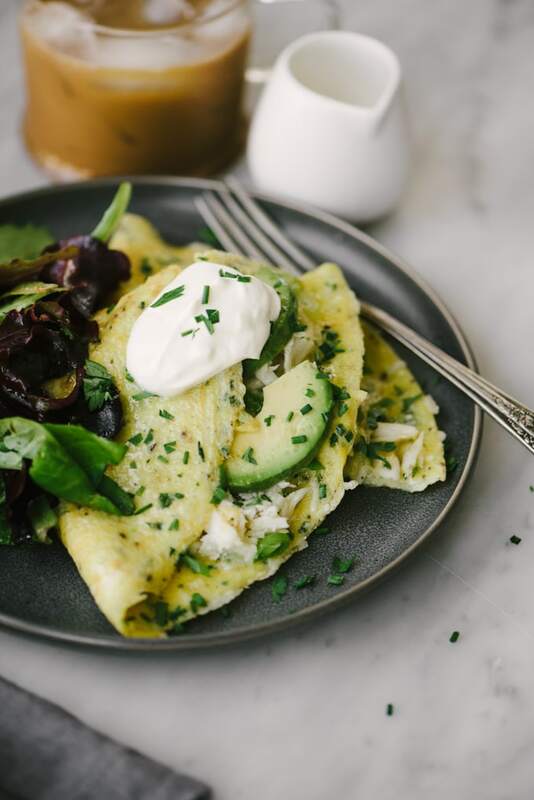 I’m not gonna lie – this crab omelet is gigantic, and you can easily get away with two servings. I cut it in half for easier plating, and serve it with a tossed green salad for brunch. Ditch the salad and enjoy it on it’s own for breakfast. Right before serving, dust it with additional fresh herbs and a dollop of sour cream for a little tang and acidity. It’s the perfect garnish. PIN IT NOW, MAKE IT LATER! 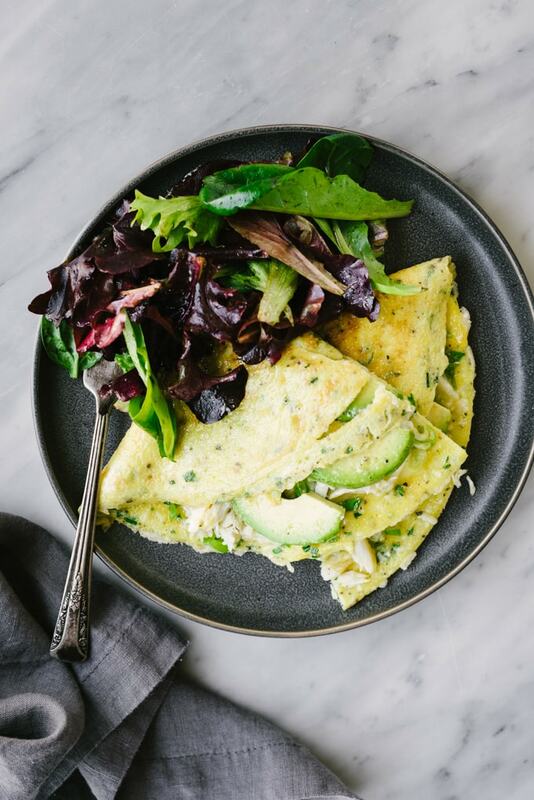 CLICK HERE TO PIN THIS CRAB OMELET WITH AVOCADO AND FRESH HERBS! 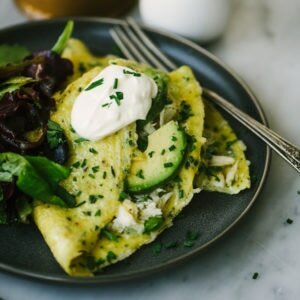 This crab and avocado omelet is a fancy but fuss free recipe that's ready in just fifteen minutes! Perfect for both an impressive brunch or fast weekday breakfast. Crack the eggs into a small bowl. 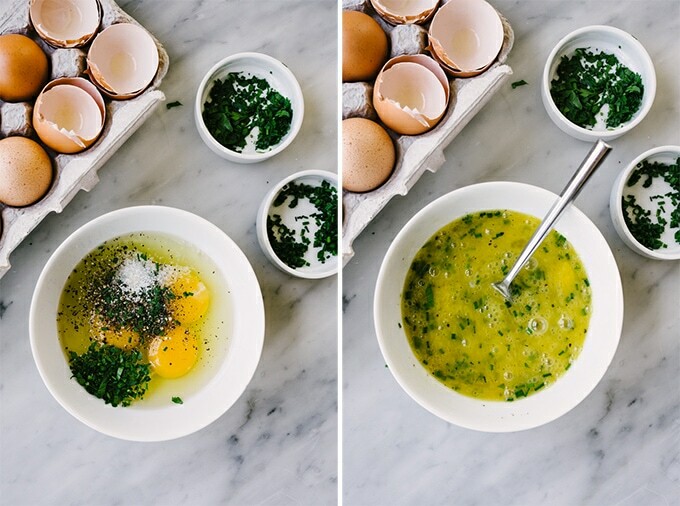 Add the chives, parsley, salt, and pepper to the eggs, then whisk with a fork until frothy. Heat a 10" non-stick skillet over medium heat. Add the butter, and swirl until it melts then foams. Once the foam subsides, pour the whisked eggs into the pan. Swirl the pan to cover the bottom with an even layer of eggs. Saute the eggs over medium heat until the edges are firm and the center is just barely cooked through, 3-4 minutes. Deflate any large bubbles with the tines of a fork. Sprinkle half the parmesan cheese over one half of the omelet. Top the cheese with the lump crab meat, then sprinkle with green onions. Layer the avocado over the green onions, then top with the remaining parmesan cheese. Using a spatula, fold the empty half of the eggs over to form a half circle. Remove from heat, and transfer to a plate. Sprinkle with additional fresh herbs to taste, and garnish with a dollop of sour cream. Serve immediately. 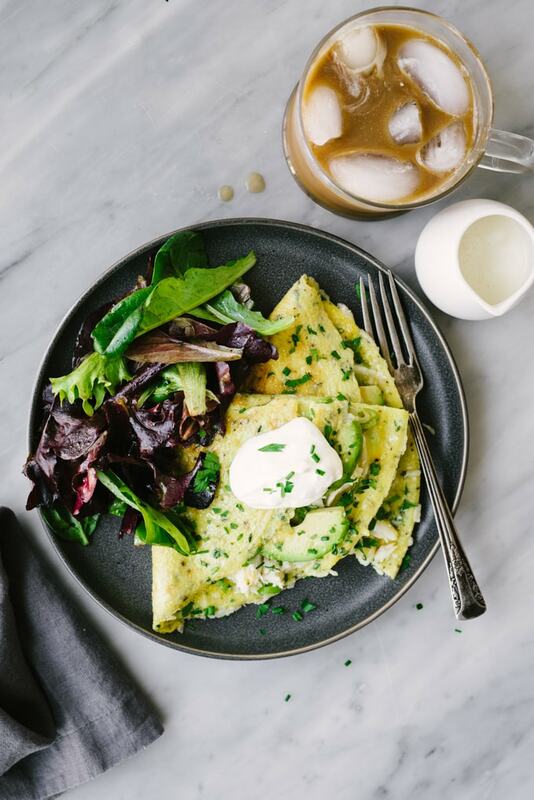 This omelet looks INCREDIBLE! Crab and avocado go so well together- YUM. The last time I had crab, I actually did put the leftover inside an omelet, and it’s just about the best thing ever. LOVE!